Road wheels used to be a simple affair with the options being the number of spokes and whether you wanted tubular (tyre and tube in one carcass) or clincher (tyre with separate tube) rim. Nowadays the choice of road wheels available is staggering but the main decision now is whether to go more aero or lighter weight. Asking which wheel is best should be put into some context; is best saving time over a distance or making the bike easier to push? Which is best depends on several factors so we’ll look at each type of wheel here. 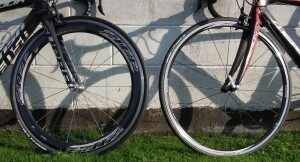 Aero wheels feature a deep rim fairing and bladed spokes making them slice through the wind better. The deeper the rim the more aerodynamic benefits (less wind resistance) there are and therefore less energy is needed to fight the wind to propel the bike forward. 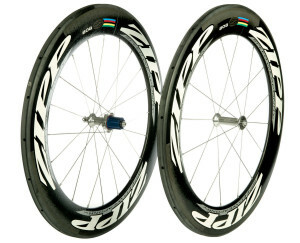 The most aerodynamic wheel in a straight line, flat course with no side wind, is a disc. All the aero benefits come with a penalty though; aero wheels are heavier than a standard spoked wheel thanks to the extra materials used in the rim fairing meaning more energy is needed to get them up to speed. In blustery wind conditions they can also be tricky to control and for smaller riders this can be a real disadvantage but they can still get the aero benefits once up to speed. Why are we not using discs then? You can only use a rear disc wheel in time trials and triathlons for safety reasons as they are so hard to control in windy conditions, have one on the front and you can forget about control! Lighter weight wheels have fewer spokes and a low profile rim section to keep weight down, basically what a traditional spoked road wheel looks like. The more you reduce rotating weight further away from axle centre the easier it is to propel the wheel meaning smaller rim depth is key for lightness. Tubular rims are the lightest form of rims as they don’t need a high rim for the tyre to hook on to and therefore save material weight. A lighter wheel not only requires less effort to propel but also reduces the overall weight of the bike making it easier to push. This is especially helpful on climbs or for smaller riders. The only penalty here is on aerodynamic terms as a standard spoked wheel and shallow rim catch more air and the faster you go the more turbulence you create. 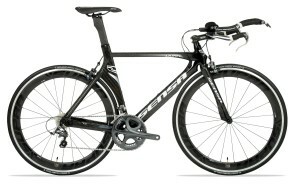 The main factor in determining whether an aero or light wheel is best is the wheel’s intended use. If you are riding lots of timed events such as time trials and triathlons especially on flat terrain where speed is crucial then the benefits of an aero rim will greatly outweigh the weight penalty. 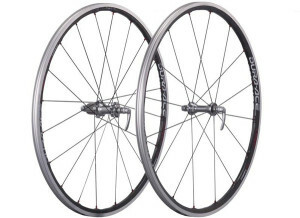 If you are riding on mountainous or lumpy terrain then a lighter weight wheel is better as it requires less effort to push and since speed is low there is no aero benefit to be had from a deep section rim. Is there a happy medium? Yes and no. Developments in carbon fibre technology have led to aero rims becoming lighter and lighter but the monetary costs are high and you still have the handling issues in windy conditions. This lightweight rim development has also led to the creation of super lightweight standard depth rims making them unbelievably light if weight saving is what you’re after. A carbon fibre medium depth rim could be the answer as it will give you some aero benefits and less weight penalty but can still be tricky to control in windy conditions. In the end it comes down to what you prefer the feel of, some people just like the look of deep section rims, but don’t be afraid to ask us for advice on what kind of wheel will suit you best for your budget. 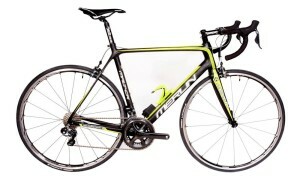 Tagged aero, buyers guide, deep section, lightweight, Sensa, Shimano, zipp. Bookmark the permalink. Hi, I’m looking to upgrade my wheels on my Boardman team carbon road bike mainly for doing time trials upto 10 miles on flat terrain. Which wheels would you recommend? Or even it’s worth upgrading.